Gooderstone is a village south west of Swaffham. There are two memorials, one in the village and the other in the church. The same names appear on the memorial and on a framed Roll of Honour within the church of St george, Gooderstone. Private 10254. 6th Battalion,, Lincolnshire Regiment. Killed in action Friday 3 September 1915. Age 25. Born Middleton. Enlisted Boston, Lincs. Lived Stoke Ferry. Son of Mr. R. and Mrs. H. Barrett, of South Gooderstone, Stoke Ferry, Norfolk. Buried: HILL 10 CEMETERY, Turkey. Ref. I. I. 10. Private 27821. 2nd Battalion,, Royal Dublin Fusiliers. Formerly 17723 Norfolk Regiment. Died of wounds Thursday 5 October 1916. Age 28. Born and lived Gooderstone. Enlisted Norwich. Son of Francis Robert and Sarah Ann Brown, of Gooderstone, Stoke Ferry, Norfolk. Buried: LAHANA MILITARY CEMETERY, Greece. Ref. I. B. 18. Lance Corporal 9083. 3rd Dragoon Guards (Prince of Wales' Own). Killed in action Saturday 23 March 1918. Age 21. Born Gooderstone Ferry. Lived Gooderstone. Enlisted Stratford. Only son of James Edward and Bertha Burt, of Beachamwell, King's Lynn, Norfolk. Commemorated: POZIERES MEMORIAL, Somme, France. Panel 1 and 2. March 23rd 1918, in his 21st year. He answered his Master's call. Corporal G/4075. 13th Battalion,, Royal Sussex Regiment. Killed in action Saturday 21 October 1916. Age 23. Born Swaffham. Enlisted London. Son of Edgar and Maria Calver, of Gooderstone; husband of Margaret Calver, of Globe Hill, Swaffham, Norfolk. Commemorated: THIEPVAL MEMORIAL, Somme, France. Pier and Face 7 C.
Lance Corporal 46542. 164th Coy., Machine Gun Corps. Formerly G/11726 Royal Sussex Regiment. Died of wounds Friday 6 July 1917. Born Clapham. Lived Stoke Ferry. Enlisted Norwich. Buried: VLAMERTINGHE NEW MILITARY CEMETERY, Ieper, West-Vlaanderen, Belgium. Ref. I. F. 16. Private 29591. 10th Battalion,, Queen's Own (Royal West Kent Regiment). Killed in action Friday 12 July 1918. Age 19. Born Barton Bendish. Enlisted Norwich. Son of Harry and Sarah Crome, of 23, Barton Bendish, King's Lynn. Buried: LIJSSENTHOEK MILITARY CEMETERY, Poperinge, West-Vlaanderen, Belgium. Ref. XXVIII. D. 6. Gunner 105212. 208th Siege Bty., Royal Garrison Artillery. Died of wounds Wednesday 27 December 1916. Age 38. Born Takley, Warwickshire. Lived Lound, Suffolk. Enlisted Lowestoft. Son of Thomas and Harriett Dixon, of Gooderstone, Stoke Ferry, Norfolk; husband of Rosetta Dixon, of 3, Rosemary Lane, Beccles, Suffolk. Buried: GROVE TOWN CEMETERY, MEAULTE, Somme, France. Ref. II. J. 13. Private 6500. 1st Battalion,, Norfolk Regiment. Killed in action Friday 20 November 1914. Age 33. Born Gooderstone. Enlisted Norwich. Son of Hagar Dodd, of Gooderstone, Stoke Ferry, Norfolk, and the late Henry William Dodd; husband of Florence Lilian England (formerly Dodd), of 646, Barking Rd., Plaistow, London. Served in the South African Campaign. Commemorated: YPRES (MENIN GATE) MEMORIAL, Ieper, West-Vlaanderen, Belgium. Panel 4. Private 28871. 2nd Battalion,, Bedfordshire Regiment. Killed in action Friday 22 March 1918. Age 36. Born Methwold. Liver Gooderstone. Enlisted Norwich. Son of William and Frances Ellen Flatt, of Gooderstone, King's Lynn, Norfolk. Commemorated: POZIERES MEMORIAL, Somme, France. Panel 28 and 29. Private 36585. 6th Battalion,, Royal Berkshire Regiment. Formerly 4308 Cambridgeshire Regiment. Killed in action Thursday 28 September 1916. Born Gooderstone. Lived Walsoken. Enlisted Wisbech. Commemorated: THIEPVAL MEMORIAL, Somme, France. Pier and Face 11 D.
Private 17742. 2nd Battalion,, Norfolk Regiment. Died Saturday 22 July 1916. Born Methwold. Enlisted Norwich. Buried: BASRA WAR CEMETERY, Iraq. Ref. VI. E. 13. Private 29861. 9th Battalion,, Norfolk Regiment. Killed in action Thursday 19 April 1917. Born Stoke Ferry. Enlisted East Dereham. Buried: VERMELLES BRITISH CEMETERY, Pas de Calais, France. Ref. VI. B. 2. Probably: Robert Holman Shinn. Private 7974. 2nd Battalion,, Norfolk Regiment. Died of wounds Monday 6 March 1916. Age 24. enlisted Norwich. Son of Francis R. Shinn, of East Bilney, East Dereham, Norfolk. Born at Necton. Buried: KUT WAR CEMETERY, Iraq N. 3. Private 34451. 1st Battalion,, Northumberland Fusiliers. Formerly 31496 Gen. Serv. Cav. Died of wounds Monday 14 May 1917. Born Gooderstone. Enlisted Louth, Lincs. Husband of A. Tuddenham, of Fincham, Downham, Norfolk. Buried: DUISANS BRITISH CEMETERY, ETRUN, Pas de Calais, France IV. G. 37. Corporal 5772198. 18th (5th Battalion, The Loyal Regiment.) Regiment., Reconnaissance Corps. Formerly of 1st Battalion,, Royal Norfolk Regiment. Died Tuesday 12 September 1944. Age 26. Son of William and Mildred Adcock, of Goodestone, Norfolk. Commemorated: SINGAPORE MEMORIAL, Singapore. Column 1. Stoker 1st Class C/KX88505. H.M.S. Sphinx, Royal Navy. Died Sunday 4 February 1940. Age 22. Son of William and Agnes Amelia Adcock, of Gooderstone, Norfolk. Buried: WICK CEMETERY, Caithnesshire, United Kingdom. Ref. Sec. O. Coll. grave 15. Special note: HMS Sphinx was a minesweeper. She was sunk by German bombers off north-eastern Scotland. WALTERS on Roll of Honour in church. Corporal 5772652. 7th Battalion,, Royal Norfolk Regiment. Died Thursday 29 May 1941. Age 23. 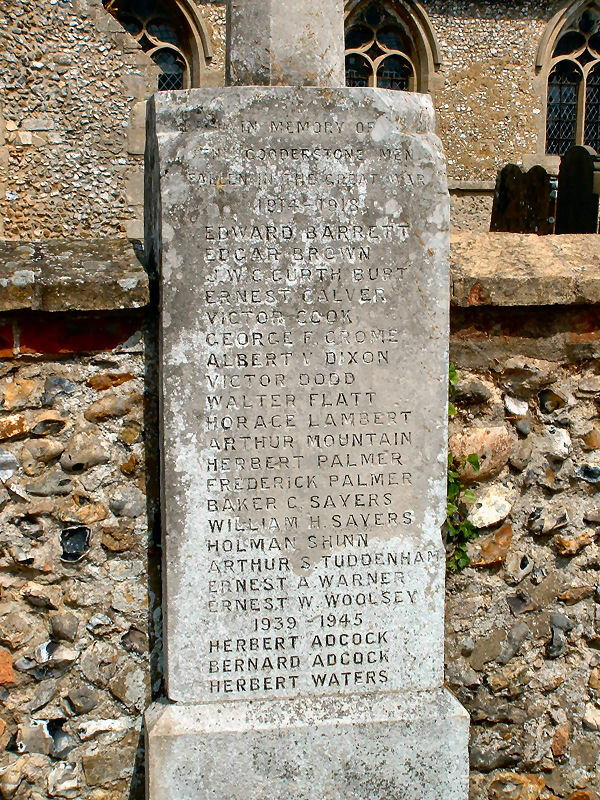 Son of Herbert and Elizabeth Maria Waters, of Gooderstone, Norfolk. Buried: POZNAN OLD GARRISON CEMETERY, Poland. Ref. 1. AA. 10.